The Buffalo Bulls continued their undefeated season on Tuesday night, moving to 11-0 on the year with perhaps their most impressive win to date. After a rough start that saw them down nine early on, the Bulls rode a late charge and defeated Syracuse at the Carrier Dome 71-59. Along with an overtime win on the road at West Virginia early in the season, and a close victory over an underrated San Francisco team in, uh, Belfast, Northern Ireland, the Syracuse win gives Buffalo a solid resume before the cakewalk of MAC play begins. One major challenge remains, and that’s a road game against Marquette on Friday. Win that, and the Bulls have a serious chance at running the table. This is all a bit surprising, but of course, Buffalo hasn’t come out of nowhere, since their destruction of Arizona in last season’s NCAA Tournament announced themselves to the world. 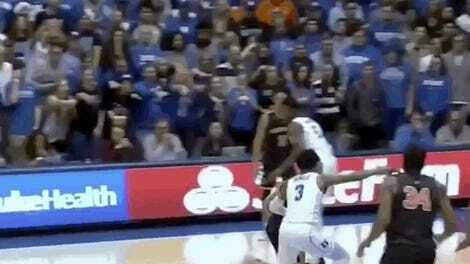 For many college basketball observers, the Bulls have already proven themselves. They currently rank 14th in this week’s AP poll, and 15th in the coaches poll, and surely they’ll rise if they can escape to the weekend with their perfect record intact. The statistical gurus of the sport aren’t quite as high on them. Ken Pomeroy and Bart Torvik both have Buffalo 23rd in the country after the Syracuse win, which is fine but not really indicative of a team that will have a major impact on the season. 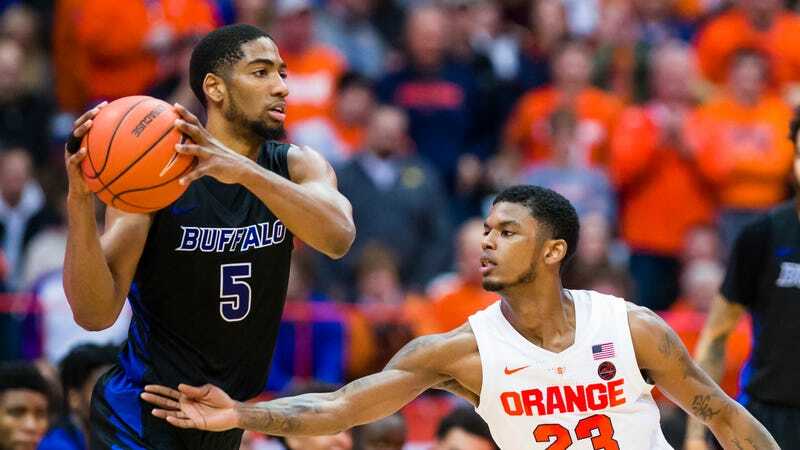 Buffalo looked markedly less talented than Syracuse on Tuesday, particularly in a first half where the Orange were comfortably able to maintain a lead. In turning the tide, Buffalo relied on tough defense, rebounding, forced turnovers, and good long-range shooting. Rather than any flashy recruits like Syracuse’s Oshae Brissett, this is a team carried by the leadership and experience of three seniors who started at the bottom: Nick Perkins, CJ Massinburg, and second-year JUCO transfer Jeremy Harris. They are the only three Buffalo players averaging double figures, and on Tuesday they had 53 of the Bulls’ 71 points. Perkins is technically the sixth man but plays starter minutes at the 5. He uses the most possessions of any Buffalo player, and also grabs the most boards, blocks the most shots, and shoots the most free throws. He generally does the majority of his damage inside the arc, but can run out to the line and take a three when needed. Harris has seen some of his numbers, especially his long-range accuracy, take a dip from his first season as a Bull, but he’s kept up a confident shooter’s mentality and manages to be at least a strong volume scorer so far, and the way he took DeAndre Ayton to school in March helped earn Buffalo the spotlight they have today. But if anyone is The Guy here, it’s Massinburg, who was the standout of both the West Virginia and Syracuse wins. The senior wingman has been a consistently efficient scorer in all four years, and so far in this one, he’s shooting 84 percent from the line and 44 percent from deep to put up a team-high 17.9 points per game. Against the Orange, Massinburg’s four threes made the difference, but versus the Mountaineers, he put a staggering 9-of-15 night from beyond the arc in a 43-point performance. In any difficult circumstances, Massinburg can pull his team through. Even if you want to poke holes in Buffalo’s successes so far this year—WVU had lost two crucial seniors and was playing its first game of the year, Syracuse was also coming off a home loss to Old Dominion—it remains pretty impressive that head coach Nate Oats has even got them back to a point where the Bulls are worth talking about. When Bobby Hurley left for Arizona State in 2015 after the program’s first Tournament appearance, and took standout guard Shannon Evans with him, it felt like the end of something rather than the start. But Oats spent the next three years building a strong foundation, and now, the results can challenge good teams from the sport’s best conferences, and there’s reason to be optimistic for the future if younger guards Davonta Jordan and Jayvon Graves keep improving. Buffalo will be off most everyone’s radar through the entirety of the MAC season, but when March rolls around again, they shouldn’t be underestimated.